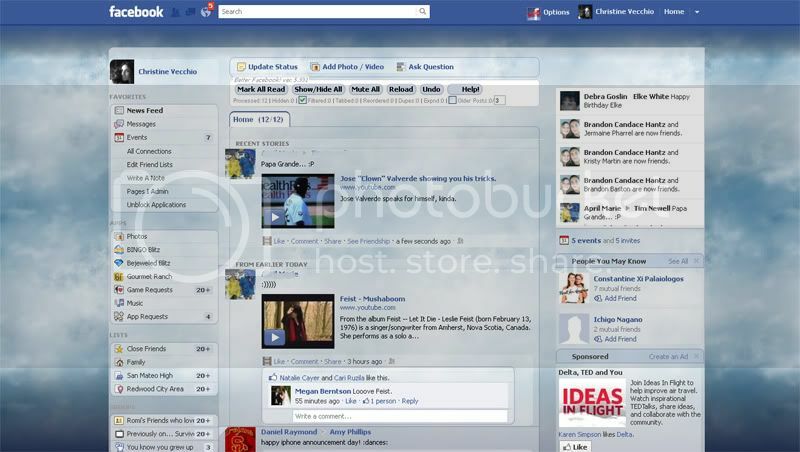 Download the "Better Facebook" plugin if you're using Firefox. It works well, and you can make it green! That's pretty cool.. way too many options and settings though lol. How comes there's nothing on interference that members can check to see whether other interference users are on facebook? Couldn't the mods set this up? EDIT . . . this is the thread I was referring too . . . it's a start! I don't have a ticker yet! You guys are lucky. I was just sort of getting to like FB when they went and crammed that annoying ticker on the page. It's just always there taking up almost a third of the FB screen (you can't scroll away from it) and it's always moving so it's really distracting. I hate trying to read with that moving all the time right next to what I'm reading, so I've just mostly stopped going to FB at all now. My facebook is almost totally unusable at the moment. The whole top half of the page is blue, and the right hand column is now smack dab in the middle, making everything else appear in the wrong spot. It means I can't play Words With Friends. Damn facebook! Anyone's fb automatically change to the new layout today?